This was the question I asked myself 8 or 9 years ago when I was attending Dreamforce and knew no one but my male boss. But two years later I had found my Salesforce tribe and started the Girly Geeks with a band of women who would have been in the same position as me; door shut, flat on the bed, feet up and TV on while other, more socially connected folk enjoyed the social life that is Dreamforce by night. 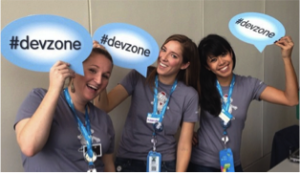 Now life is completely different for women who attend Dreamforce. There’s a tribe waiting for you and a ton of events with their doors wide open. On Monday evening Dreamforce opens a day early when the Salesforce Women’s Network and the Girly Geeks host a panel discussion where the speakers share stories and experiences and offer real world advice about conquering fears, being brave, making a difference for yourself and others and knowing when to move up and on. The discussion is always lively, funny, touching, educational and from the heart. You will leave inspired and uplifted and will make new friends. This is a female-led, women-focused event but men are invited and you will bump into a few brave souls who have been huge supporters of women in tech long before it was cool. I am especially looking forward to hearing from Diana Bell and learning more about Emily’s list and how they have supported women in the political arena for 30 years believing that “early money is like yeast” because seed funding political campaigns enables women to rise in the political sphere. After the panel you’ll have the chance to mix and mingle with other attendees – be sure to swamp numbers so you have a face in the crowd to hang out with and attend the gala with. Register for this free event and you don’t need your Dreamforce badge to attend: just bring yourself at 6pm! Growing Developers: how to cultivate developers to meet the needs of a growing tech economy, in ways that create new job/business opportunities and add diversity to the tech workforce. Workplace Inclusion: how to use technology to increase diversity at work & how to recognize our own unconscious biases, and rethink our assumptions to make our companies more inclusive. This is going to be a really fun and funny activity through the week. Sign up to take part in the Apttus photo scavenger hunt and win prizes and kudos if you can tweet a selfie with Jessica Alba, show yourself taking a hands-on-training class or squeeze a pile of Girly Geeks into your camera shot (my name is on that one!). Sign up, follow @GGPhotoHunt on Twitter and post away to win swag, dollars and t-shirts in this fun competition. What makes Dreamforce different from other tech conferences is that throughout the week there are many sessions not just comprising of women speakers but led by influential women in the industry. These are authorities in sales, business processes, marketing, coding, architecture, entrepreneurship and startups but don’t attend these sessions because they’re women – attend because they are experts. On Thursday there is an entire track focused on women who have succeeded in male-dominated worlds of work. CEOs, supermodels, actresses and founders will speak alongside Salesforce executives and discuss diverse topics such as implementing equal pay policies, exerting board influence, building a diverse company culture and developing a diverse talent pipeline of next generation employees. Diversity in tech doesn’t end on Friday when you leave Dreamforce – take it home with you and participate all year. On the Success Community you’ll find local and virtual groups to support you in your Salesforce career path such as the Admins with Disabilities group, global Girly Geek chapters, LGBT group, Latinos group and many others; search for your interest and join or create your own.